As I shared in my post ‘Sparkling seascapes and creative photo books‘, I have been commissioning articles for Digital Camera magazine’s Projects section. Written by photographers and edited (and sometimes added to) by me, they share the tricks and inspiration behind some of their beautiful photos. For Issue 194 of Digital Camera magazine, I organised the following project articles on photographing frozen flowers, graphical abstracts and stormy seascapes. These were the projects I had most involvement in for this issue, as colleagues and an intern I supported worked on the other projects in this issue as well. 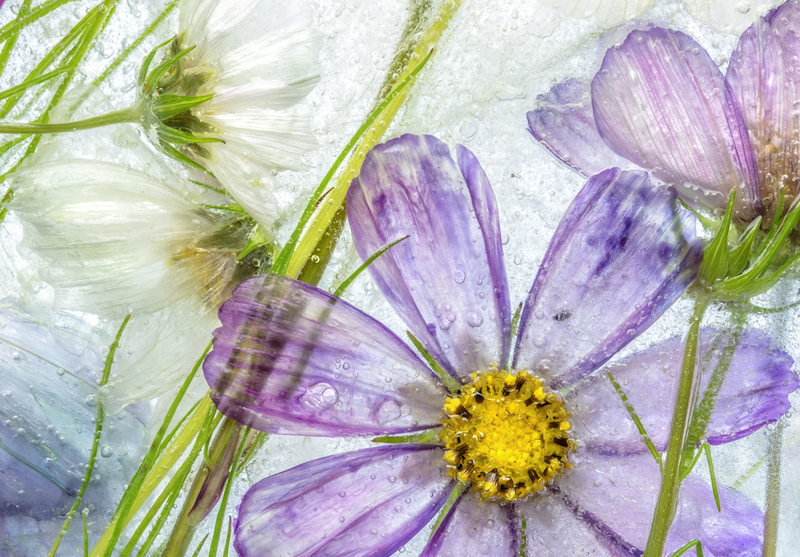 Still-life specialist Mandy Disher shares how to create unique and beautiful floral art by photographing flowers encased in ice. “Using a macro lens can get you close to flowers to reveal their wonderful colours, enthralling textures and tiny details,” she writes. “The process of freezing flowers is unpredictable, yet fascinating and surprising too – you never know where the bubble trails and wonderful icy patterns will develop in the block. “Flowers are diverse and they can respond differently to the freezing process due to their thickness or density. Some flowers are changed little by the ice, while the petals of delicate blooms may take on a wonderful transparency. David Queenan finds incredible colours and textures that look like paintings. At first glance, David Queenan’s abstract photographs look like modernist paintings. The deep blues marbled along the bottom of one image look as though they’ve been built up with layers of oil paint on a canvas. Contrasted with a crisp, uniform red line, you might wonder if the artist is making a statement with this precision. In another, indigo tree shapes appear like shadows against a deep, inky background, and are topped with verdigris fronds. In fact, these masterpieces are the hulls of fishing boats, captured on camera by chance. “Being a graphic designer (as well as a photographer), I enjoy the creative process of finding abstract art in what some might regard as mundane objects,” David explains. “It can also be a good way of passing the time while waiting for the light to improve or if the weather isn’t great when out shooting landscapes. Forget shooting calm, boring seas and embrace a storm’s wild energy, says Rachael Talibart. “My photo challenge is to capture a stormy seascape,” she writes. “Finding a safe yet striking location is key to getting a good shot, along with protecting your precious kit! “Long exposures that smooth out texture have been popular for some time. But when the sea is rough, very fast shutter speeds are an interesting alternative, as they capture all the detail in the dramatic waves. “Shooting with a Canon 5DS R and a 70-200mm lens, I used a shutter speed of 1/1,000 sec and a narrow aperture, so that I could freeze the motion of the waves to reveal their strange shapes. Read more of these projects, and other exciting photography articles, in Issue 194 (September 2017) of Digital Camera magazine.